Sri Vijayarama Purana Viharaya is said to have a history of over two-hundred years and there are artefacts within the temple which prove that the temple existed here since 1728. At the temple, you would be able to see a wooden statue of Buddha which is also the largest one in South Asia. The entire temple complex in fact has rooms that consist of wooden statues of Buddha sitting in different mudras along with several other statues that have all been perfectly carved. The biggest wooden Dharma Chakra in Asia can also be found at Sri Vijayarama Purana Viharaya. Even the doors here have wooden carvings and each and every element here is worth admiring. How popular is Sri Vijayarama Viharaya? People normally club together Ambalangoda and Natural Moonstone Mine while planning their visit to Sri Vijayarama Viharaya. Best place to see wooden carved “Buddha Status” in various “Mudras” (hand gestures and seating postures) in Sri Lanka is Sri Vijayarama Purana Viharaya (Temple) in Kaluwadumulla, Ambalangoda which is just 1 km away from Colombo-Galle (A2) Road. Also Image house contains traditional wooden designs of door frames & windows. This wooden designs show the skill of persons of traditional wood carving industry in Sri Lanka. Place with lots of creations of arts related to buddhist culture. Statues paintings lots of works related to Buddhism can be seen there place is always open to both local and foreign visitors everyone is invited to see the utmost beuty of this place make sure you visit this place at the night to see the true beauty. Excellant place to visit particularly as a Buddhist. Many beutiful wooden Lord Buddha statues. Very important for students. 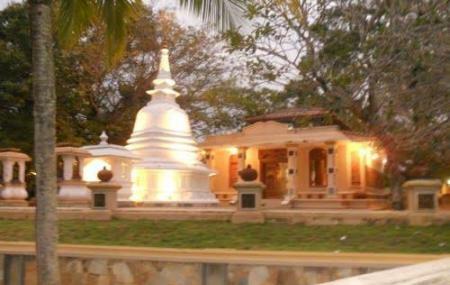 One of the great temples in Ambalangoda.